St Catherine's Trust (of which I am Chairman) can now announce a the dates for our events in 2012, including a new venue for our Summer School, the Fransiscan Friary and Retreat Centre at Pantasaph in Wales. I noted before that the St Catherine's Trust Summer School won't happen this year. We were booked into Ushaw College and have been left high and dry when they announced their closure, since venues need to be booked about a year in advance. The Summer School has been taking place every year since 2005, and has been a great success. We were amazed to get more than 40 students in the first year, and since then numbers have been up to 55. 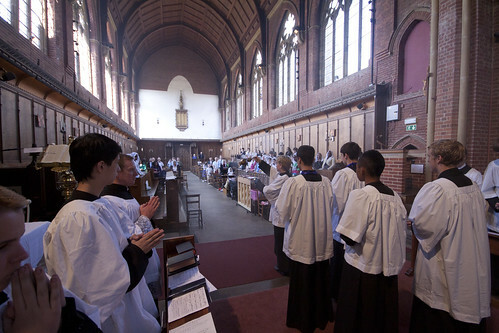 We have used a couple of non-Catholic boarding schools, but were determined to get into a Catholic venue, and preferably not one we would have to share with enormous numbers of language students, who tend to take over these places in the Summer holidays. After a vast number of enquiries and some site visits we have secured Pantasaph Retreat Centre, which is near Holywell. 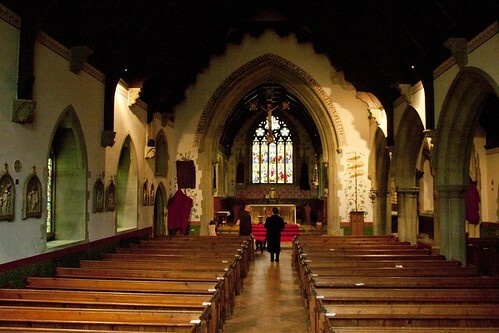 It has a Pugin Chapel and is located in beautiful countryside near to one of the UK's most important Catholic shrines, the Holy Well of St Winifride which gives Holywell its name. Pantasaph is itself the location of a shrine to St Pio, 'Padre Pio'. 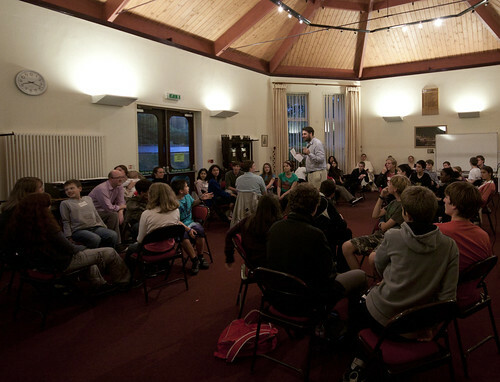 The Summer School will take place Sunday to Sunday, 22nd to 29th July 2012. We have also agreed the dates of the next Family Retreat at the Oratory School in Oxfordshire, which will be over the weekend of Low Sunday, ie 15th - 18th April 2012. 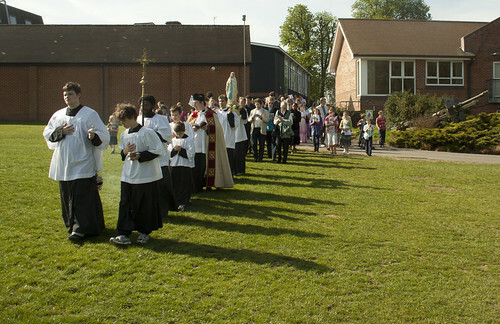 Marian procession at the 2011 Family Retreat at the Oratory School. The Summer School includes not only catechesis from a priest, but inspirational teaching from our volunteer staff on a range of subjects, designed to supplement what is taught in a mainstream school, or indeed a home school. We discuss topics in Catholic history, literature, art, and philosophy; the students are introduced to Gregorian Chant or sacred polyphony, Latin and even a bit of Greek; they put on a staged reading of a radio play, and do a range of activities in the afternoon - they choose between various outside activities and sewing and drawing. We always have one or two outings to local places of interest. Plus we have Traditional Sung Mass every day, plus Compline, daily Rosary, and Benediction a couple of times during the week too. All this takes place in a safe environment: all our staff are CRB checked, we have public liability insurance and include first aiders among the staff. This is a unique opportunity for children aged 11 to 18, so please put these dates in your diary now.